Hyperflite, maker of state-of-the-art flying discs for dogs, announces the availability of a free digital book for dog lovers. 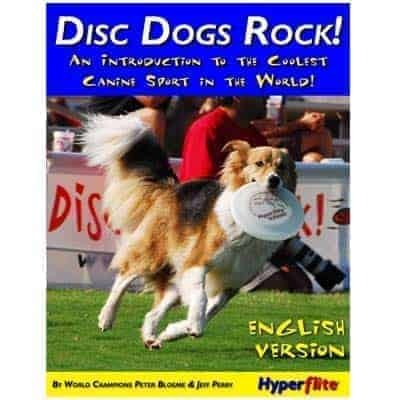 Whether you call them disc dogs, disc canines, or Frisbee dogs, this full-color publication, entitled Disc Dogs Rock!, has everything you need to get started in the coolest canine sport on planet earth. Disc Dogs Rock! is loaded with the information you need to take your relationship with your pet to the next level. Disc Dogs Rock! features 40 pages of tips, training methods, illustrations, and photographs courtesy of the foremost authorities on disc dog sports — World Champions Peter Bloeme and Jeff Perry. Any dog can learn to catch a flying disc and there is no better exercise for your canine. Whether you want to enter the exciting world of canine competition, or just have fun with your canine in the backyard or at a nearby park, getting started is just a few mouse clicks away. Available here as a digital download in pdf format.